I’m flagging a ‘last chance to see’ that gives you precisely two days in which to catch this show. A little pressure can be a good thing sometimes, don’t you think? Maeve Brennan was featured by Art Review magazine as one of their Future Greats at the beginning of the year. Artist Phillip Lai wrote of her work that it is “born out of a commitment to slowness, to unassuming curiosity and to the idea of the journey”. 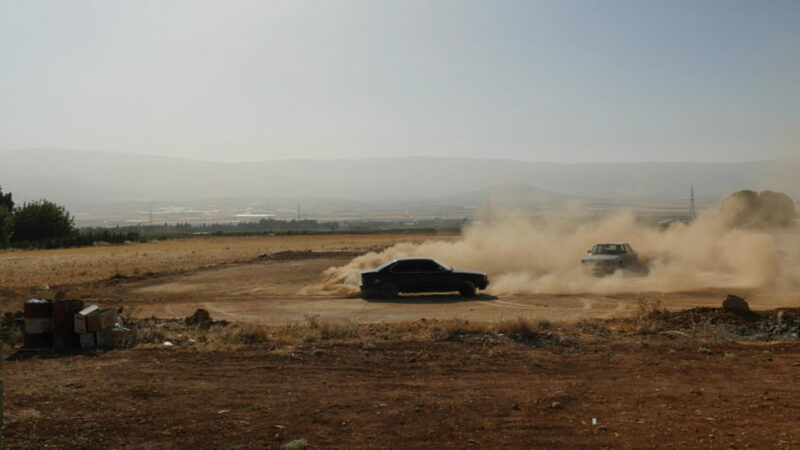 The Drift is a portrait of a small group of individuals, all living and working in Lebanon. Of course this setting begs a political reading of the work, but Brennan approaches the subject obliquely, with a long historical lens. Brennan lives between London and Beirut and it is immediately clear that the subtlety of her engagement with her subjects is the product of long contact. The film combines documentary footage taken by the artist in the course of her ‘fieldwork’, with staged scenes that provide moments of greater intensity in her depictions of character. The deft switch between the two modes of filming adds another layer of interest. There are fleeting moments when the speakers address their interviewer directly, and at least one when they betray an acute, and highly contemporary awareness of the ‘optics’ of the situation. Fakhr el Fakhry is the ageing and amiable guardian of a number of Roman temples in the Beqaa valley. 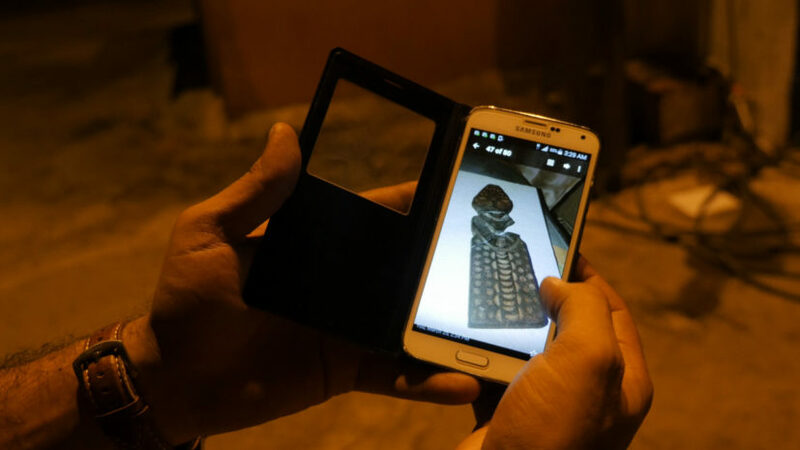 Having inherited the job from his father at the age of 17, he has spent a lifetime restoring the temples and protecting them from theft and vandalism. Sitting with friends in the shade of trees, el Fakhry looks over his shoulder and says ‘Give me a cigarette’. His friend obliges, grumbling “I’ve been telling him all morning to have a cigarette, it would look nice on film”. 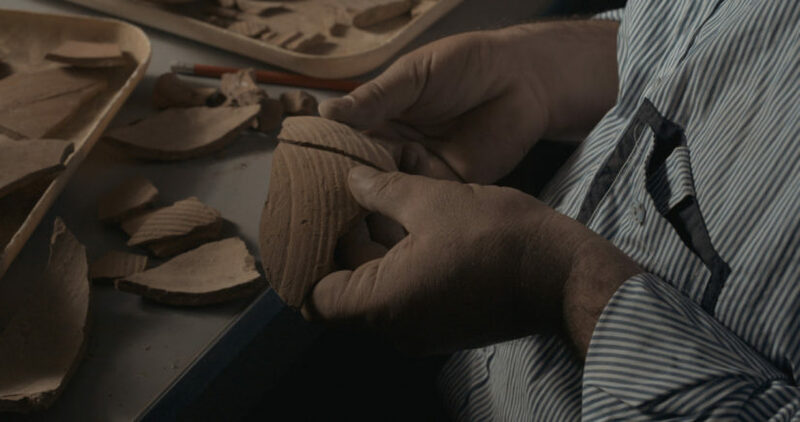 Other major characters in the film are Hashem, the self-taught archaeologist who for 25 years has painstakingly reassembled pottery shards into their original forms, and Mohammed Zaytoun, a young mechanic who makes a living restoring superannuated BMWs. 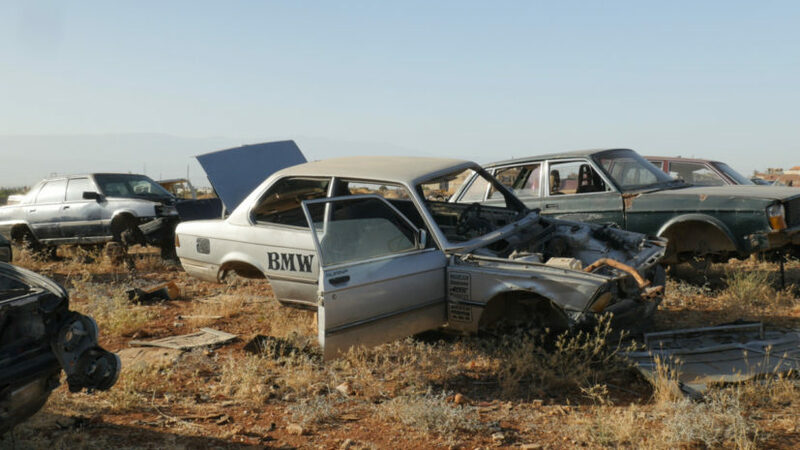 “I was raised in scrap yards” he says at one point, and while his endless mending and modification of cars resonates with the theme of care and restoration carried by the other characters, Mohammed is resolutely focussed on the now. He tells a story of Roman graves discovered in Baalbek, and of his bitter disappointment in learning that they were the final resting place of poor people, with no precious grave goods to be plundered. 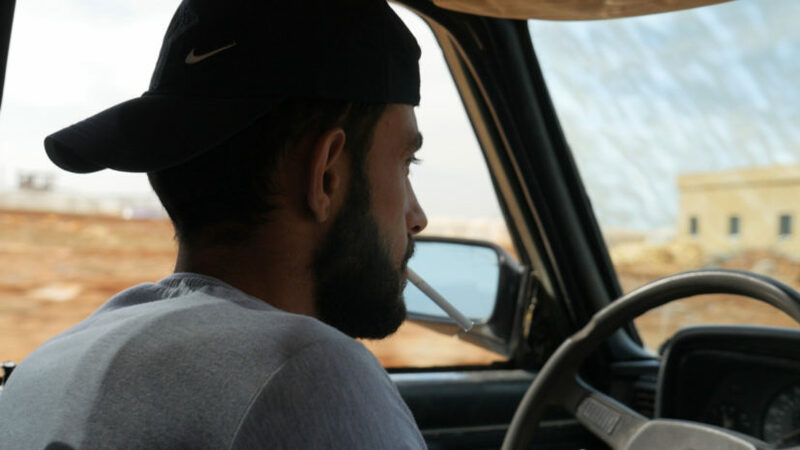 Mohammed leads the viewer to the ancient smugglers road that now sees two-way traffic between Lebanon and Syria, with stolen cars travelling in one direction, and looted antiquities in the other. 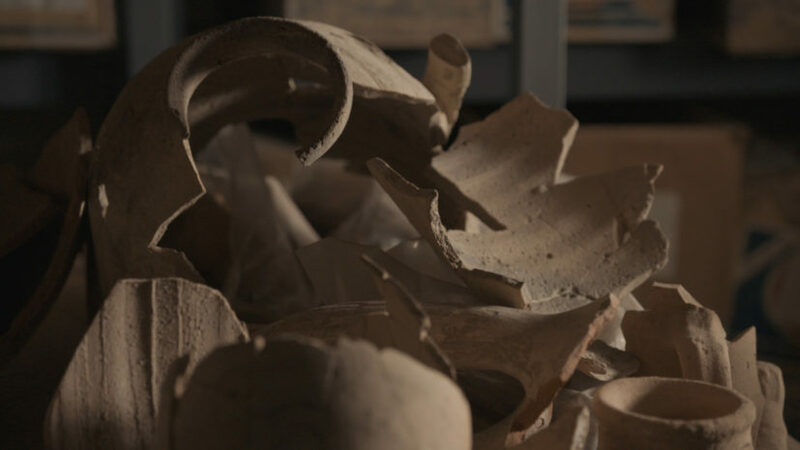 Hashem is filmed in his basement, his experienced hands and practiced eye feeling the edges of jagged fragments of earthenware jars, and finding the piece’s brother, one that will sit closely into its contours. Silence and concentration hang heavy in the air. El Fakhry talks of the stones of the temples as being ‘in his blood’ after spending 42 years living and working on these sites. 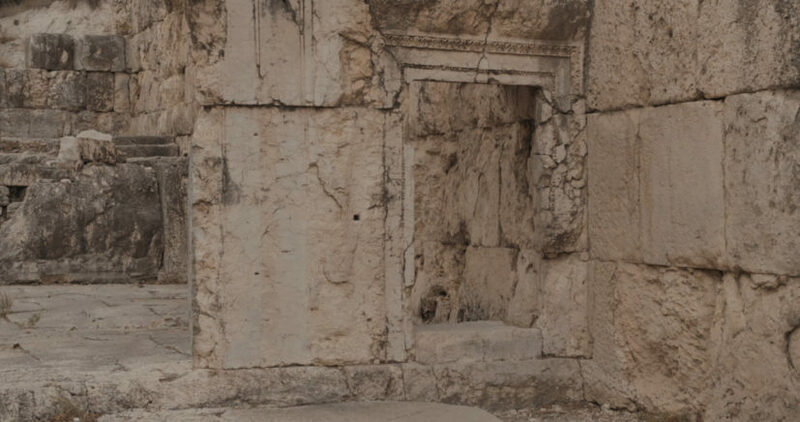 This long archaeological perspective conjures the memory of millennia of conflict, even though the present security situation occasionally appears in the form of a distant figure with a rifle on his back, or a helicopter whirring by. Meanwhile the charismatic Muhammed, dressed in jeans and a Nike baseball cap that could place him on almost any city street in the world, plays with his cars. Rather than sitting around in the evenings telling the same old stories to the same set of friends, he tinkers and improves in order to burn around the district the next day. 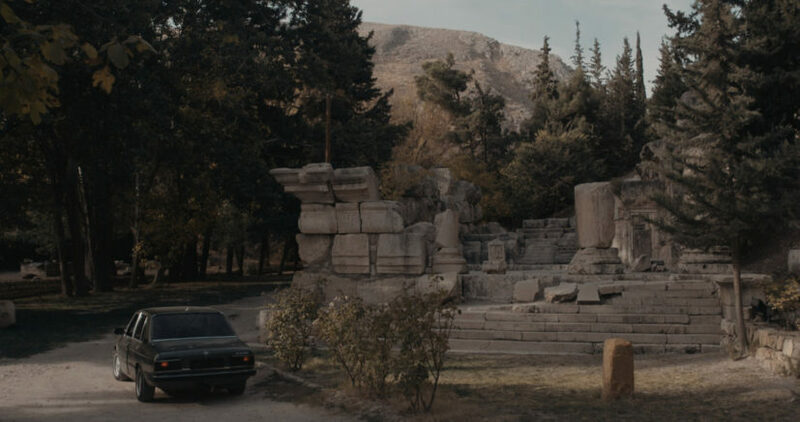 There are long sequences of Muhammed, pulling doughnuts in yellow dust, or another of him revving through a deserted landscape, spiked with cypress trees and temple ruins as picturesque as anything in Sicily or Turkey. “Wherever we go, we drift. We leave our mark”, he says. The multiple meanings of the word drift lend a philosophical tone to this remark, even though the ‘drifting’ he refers to is the high speed, sideways slide of a car with the wheels locked. These circular marks are what Muhammed leaves on the landscape that has been the site of so many battles, and the march of successive civilisations. Earth that has yielded up treasures as well as bodies centuries old, and has seen so many fall in more recent years. Brennan’s portrait of these individuals in Lebanon is sensitive, sympathetic and nuanced, all the while overlaid with the optimism inherent in the metaphorical act of mending.